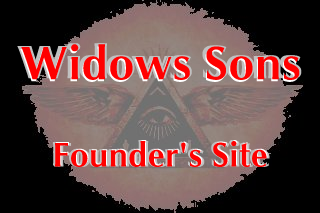 The sole founding goal and purposes of the Widows Sons is to aid and assist widows and orphans of Master Masons. This should be done autonomously in each state by the founding of a Widows Fund from within the Grand Chapter of the state or by raising funds and donating them to the Grand Master's fund for wisdows and orphans. Aiding and assisting widow's and orphans is the first and foremost purpose of granting a charter for any Grand Chapter. Always remember: The Widows Sons were founded to aid and assist widows and orphans of Master Masons. No other charity or any other object of monetary support, from any Widows Sons Grand Chapter, or any affiliated chapter, or any member should take precedence over the Widows and orphans of master Masons in its Masonic Jurisdiction. The second purpose of founding the Widows Sons was to promote fellowship and unity among brother Masons who ride motorcycles. The third purpose of the founding of the Widows Sons was to introduce Freemasonry to the world of motorcycling and to introduce the world of motorcycling to freemasonry. No chapter or any member of any chapter should ever recruit non masons motorcycle riders for the purpose of increasing the Widows Sons numbers in membership. The Widows Sons shall not allow any member of any outlawed organization(s) or any other motorcycle club(s) to become a member of any chapter of Widows Sons, nor will any member of the Widows Sons associate with any member(s) of any outlawed organization(s) or any motorcycle club(s) while wearing Widows Sons or masonic regalia. No Widows Sons Grand Chapter shall have any voice, or any rule or authority over, nor any vote in the business of another Grand Chapter. Each Masonic Jurisdictional Grand Chapter is autonomous of one another. Autonomous, being defined as; ruling and governing their own state business and activities in accordance with the due boundaries of Freemasonry of their state, first, then within the due boundaries of their Widows Sons by-laws and landmarks of the Widows Sons. There shall be no governing or ruling committee or consulting body, or person in a position with any authority to make decisions for, council, or to rule over the entire national entity of the Widows Sons. Each state rules all Widows Sons business in its own state within the due boundaries and governing of the their Grand Lodge and the the boundaries set forth by the Widows Sons Masonic Riders Association bylaws. An Widows Sons Grand Chapter, who has been deemed in good standing by the Widows Sons Masonic Riders Association for 365 consecutive days may charter a new Grand Chapter in another state into existence upon the promise given by the chapter that it will adhere to its Grand Lodge governing and the Landmarks of the Widows Sons, ,adapting the Founding by-laws only necessary to resolve any conflicts in these by-laws and landmarks with their Grand Lodge by-laws, rules or edicts. No other changes to the founding by-laws or founding landmarks should be made to appease any personal or Grand Chapter preferences. No single person shall issue charters to new Grand Chapters. They must be chartered by a Grand Chapter or the Executive Council Executive Director. At the time there are fifty (50) Grand Bodies of Widows Sons in the United States, and bodies outside the U.S. Changes, alterations or amendments or additions to the Widows Sons Founding By-laws or the Founding Landmarks shall be made with a ratification vote of a ninety (90) percent majority of the fifty (50) widows Sons United States chapters and all chapters outside the U.S. by a ballot voting in favor of the purposed changes, or by a Grand Lodge proclamation. Adopted: 2001:When a logo, patch or insignia of the Widows Sons is adopted, only men who are Masons shall wear it. No wives, girlfriends, sisters, daughters, moms or grandmothers shall display a a Widows Sonpatch on their back. There will be no ladies’ or support or associate patches. No member or affiliate chapter shall create a patch, button, decal pin or any other item that advertises, names or promotes the Widows Sons without the permission of their Grand Chapter. The use of our trademarked logos are reserved for Grand Chapters who have entered into an agreement with the Masonic Riders Association through a fair use contract describing the uses of the logos and name.